Figure 19, from the paper. This article originally appeared on 5 December 2016, but I’m reposting it because interest in the EM Drive has renewed. RT reports, “China’s announcement would put them ahead of NASA in the race for an EM Drive.” Yahoo reports, “A video put out by a Chinese propaganda channel claims that Chinese scientists have a working prototype — something NASA has failed to achieve.” The doubts I express below have increased. Heard of the EM Drive? EM is for electromagnetic. The idea is that, in an enclosed cone, some microwaves are bounced around, and that this bouncing somehow propels the cone, and presumably whatever is attached to it, forward. Nothing comes out of the cone, mind. There is no propellant. The cone is sealed tight. So how does it push, when nothing pushes back against it? As one popular article put it, the EM Drive appears to violate Newton’s third law, which is for every action, there is an equal and opposite reaction. In the EM Drive, there is an action but no apparent reaction. Conservation of momentum is no more. Apparently. Another name for the machine is the RF resonant cavity thruster. A version of it was put to the test recently by NASA. And it seemed to work. 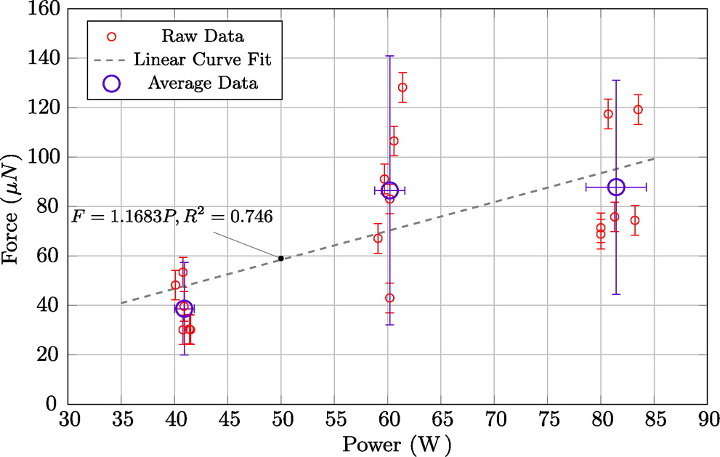 The paper (which is free to read) is “Measurement of Impulsive Thrust from a Closed Radio-Frequency Cavity in Vacuum” by Harold White, Paul March, James Lawrence, Jerry Vera, Andre Sylvester, David Brady, and Paul Bailey in the Journal of Propulsion and Power. You have to read the paper for the introduction and apparatus and experimental description (there is no reason to repeat it here). Many readers of this blog won’t have trouble understanding the gist. Finished reading the paper? Let’s jump to the end. Figure 19 is the summary of results of the tests of the forward and reverse thrust vacuum testing. The large, original version should be consulted instead of the smaller image which leads this post. Power was varied and force estimated. The red circles are the results of the estimates of force from individual experiments at the given power levels. The purple circles/lines are only averages and can be ignored. A (dashed gray) line was over-plotted, the result of a linear regression of power and estimated force. Technically (and you can ignore this point), the uncertainty in the estimated force should be used in the regression, but it’s not clear they did this. That means the gray line, and subsequent equation Force = 1.16843 x Power will be too certain. Skip the technicalities and notice something more important. The red circles at powers of about 40 W are tightly clustered and indicate a low level of estimated force. The red circles at powers of about 60 W are much more variable, but do indicate some (not all) higher levels of estimated force. But the red circles at 80-85 W look to be about the same, with a tad less variability, than the estimated forces at 60 W.
In other words, it appears as if the estimated forces tails off, or plateaus after 60 W. Might the estimated force jump or increase again at, say, 200 W or greater? Sure. It might do anything. But all we have is the data in front of us. And from that, it looks like it levels off. But so what. 100 micro-Newtons is still greater than 0 Newtons, and any force north of 0 proves the concept of the EM drive. That’s brings us to the second consideration. That leveling off casts suspicion that a form of energy leakage has not been identified. We’d expect greater thrust with greater power levels, but we didn’t see it, which is evidence, but far from conclusive evidence, that something has been missed. We’re talking estimated micro-Newtons here, so it wouldn’t take much leakage to provide the thrusts seen. I found this to be the most fascinating part of the paper. The authors took leakage seriously and went to great pains to measure potential errors. But from the language describing some of the sources, you have to wonder if a wee bit of over-confidence snuck in. The second error is RF interaction with the surrounding environment, which has the potential for possible RF patch charging on the walls of the vacuum chamber interacting with the test article to cause displacement of torsion pendulum. Leaking RF fields are kept very low by ensuring RF connections are tight and confirmed by measuring with an RF leakage meter (levels are kept below a cell phone RF leakage level). Any wall interaction needs to be a well-formed resonance coupling and, because of the high frequency, will be highly sensitive to geometry. Well, it’s true at these frequencies geometry is important (ask anybody who builds antennas for gigahertz signals), it’s also true these same RF signals show up in the damnedest places. I merely mention this as one example of how one can fool oneself. I’d be thrilled to learn my doubts were baseless, or were quibbles, and the EM drive worked. But there are more doubts about how the EM drive is supposed to work. Quantum mechanical pilot-waves. If you don’t know about these, you’ll have to wait for another day. But the authors appear to mix up, as most do, what is from our knowledge of what is, of the ontic with the epistemic, with ontology and epistemology. I’ll save those criticisms, because what is above is enough for now. Update Forbes is talking about it, and so are others. You probably also doubted cold fusion. A version of Maxwell’s demon. I didn’t read the whole paper but where did you get the idea these are estimates vs. measurements? The thrust measurements were made using the low-thrust torsion pendulum at NASA Johnson Space Center. This torsion pendulum is capable of measuring thrust down to the single-digit micronewton level. I searched the paper for the word “estimate” and it wasn’t found. Not sure why you would dispense with the averages. Those are more representative of what you would get by blurring your eyes while viewing a point-plot. cloud. I agree that the data appear to have tapered and a linear regression seems inappropriate. Maybe they can up the power by a factor 10 the next time around and see what they get. When Wikipedia reports presents a sci-fi writer as an authority to critique an idea, the idea is probably worth dismissing…that or dismiss Wikipedia as a source…. The purpose of the test was to see if some tiny amount of thrust was possible, and it appears there is — if thermal effects can be ruled out (and the other identified, or for that matter unrecognized) sources of error are also ruled out. Well, the good news is it’s not Rocket Science, so how hard can it be? I agree with Ted. We could power this thing with cold fusion. AI-controlled, obviously. Probably caused by an anomalous interaction with subspace. Or maybe a power surge. Emdrive results being in error is so obvious, that it is ridiculous for anyone to think otherwise. Well, two things. I would like to see a few data points and corresponding error bars at zero power input. Also, I am curious as to how the power cable is attached to the EM drive in such a way as to ensure that no torque/tension/force is applied to the torsion pendulum. Very, very tentative results. Yeah. I agree with you. I’m an RF/Microwave Design Engineer and personally I’ve been fooled numerous times thinking I’ve discovered something extraordinary. Every time, though, I really just discovered I didn’t understand RF as well as I thought. It is really magical acting at times. APL – you are “curious as to how the power cable is attached to the EM drive”? You missed perhaps the coolest part of the apparatus: “Galinstan liquid metal contacts”! Sounds like something Scotty would have come up with in a pinch. It certainly would be nifty if this proves out, since it would mean a new (and very useful) physical law has been discovered. But skepticism seems to be in order. I’d put my money on something simple they are overlooking, probably heat related, something like the effect in the Crookes radiometer. And I agree, the unnecessary extrapolating to the kW level reveals that they are assuming what they are trying to prove. I’ve still been thinking about this. Usually in my experience these types of strange results were alway from some sort of calibration issue.Also, If they are using multi port analyzers a lot of weird stuff can happen. But what’s really interesting is that if the government were to get behind this there could really be a lot of money spent on it. People would be in charge of big programs. Anyone against the New Perpetual Motion would be rightly labeled “Anti Science!”. As an RF engineer, and skeptic of this, it would be pointed out that, “yes,well you’re an RF engineer, but you don’t have a PhD like these brilliantly funded people! Look how smart they are! They’re scientists for the Govermnent! Who’s funding you? Morton Thiokol probably!”. Sound familiar? No, it doesn’t sound familiar. What’s it supposed to remind me of? What is “…at best more than 10 times smaller …”? One-tenth as much? Wouldn’t that be as much as ten times less unclear?